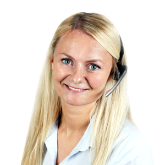 In the category accumulators and batteries, a vast assortment of products for off-grid power supply for electric and electronic devices and circuits is available. Besides various accumulators and batteries of the types AA, AAA, Baby, Mono or 9V blocks we offer a series of miscellaneous button cells with diverse voltages. The accumulators are based on different technologies such as lead, lithium iron phosphate, nickel cadmium, nickel metal hydrid and feature varying capacity values. Batteries are available, among others, as alkali-manganese, lithium, silver-oxide, zink-carbon and zink-oxygen models. To round of the range in this category we carry matching battery holders and battery contacts. Depending on the intended application, the battery holders are equipped with 9V clips, cables or soldering tags or are suited for direct PCB mounting. 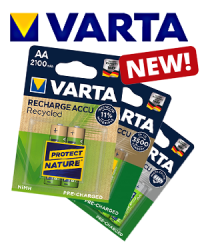 From now on you can get the latest generation of VARTA rechargeable batteries in our shop! 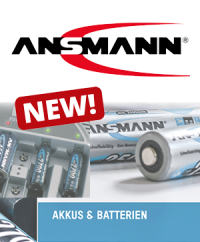 We have added numerous batteries from Ansmann to our product range.